I saw a lot of people on bikes on Saturday. Many of them were on National Cycle Network (NCN) Route 2 along the Sussex coast, between Worthing and Brighton, explored by the group I was with on the Cycling Embassy of Great Britain Infrastructure Safari led by Jim Davis. NCN 2 here is largely traffic-free, and it is, of course, only traffic-free space that gets people on bikes as a mass movement, as Sustrans, the charity behind the NCN, have always realised. 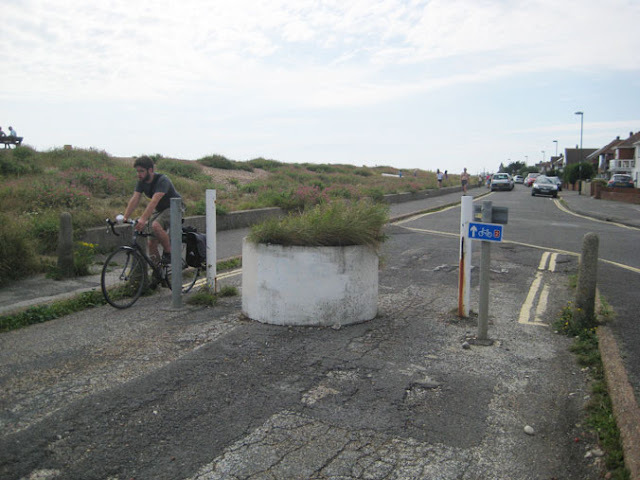 It is sad that so many compromises and manifest inadequacies exist on all the NCN routes that I have seen, however, and this is particularly true of NCN 2 on the Sussex coast, fitted in cheaply inbetween existing infrastructure with inadequate capacity and too many conflicts and "cyclist dismount" locations (one would be too many). 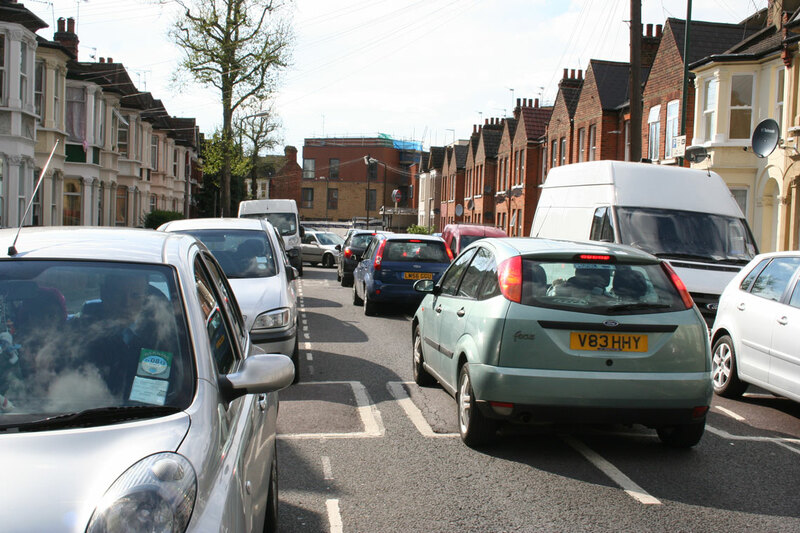 This failure to accommodate the demand for leisure and commuting cycling space adequately in the UK limits the take-up of cycling, when we should be doing everything we can to encourage people to be more active. It is a crazy situation that comes down to the existence of inadequate political structures for delivering and funding desirable changes to our environment. To be attempting to develop a national stratgic infrastructure through a charity rather than government agency is crazy: and to say that is in no way to do down the great and noble efforts that Sustrans employees and volunteers make to at least deliver something. It is particularly sad to see penny-pinching and compromises that will reverberate down future decades being built into new, expensive infrastructure. 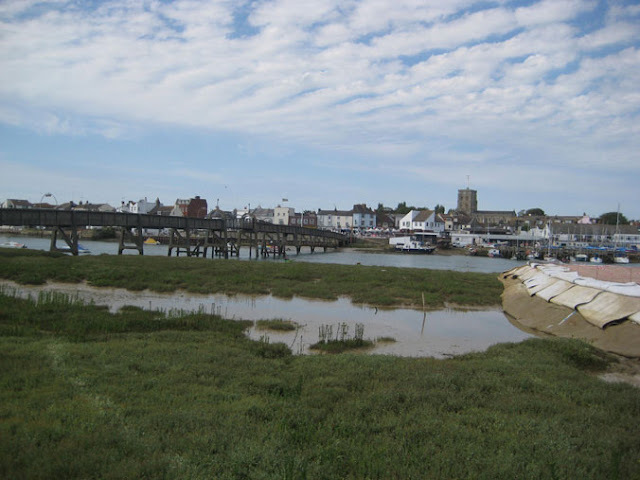 At the quaint town of Shoreham-by-Sea, the route needs to cross the harbour. 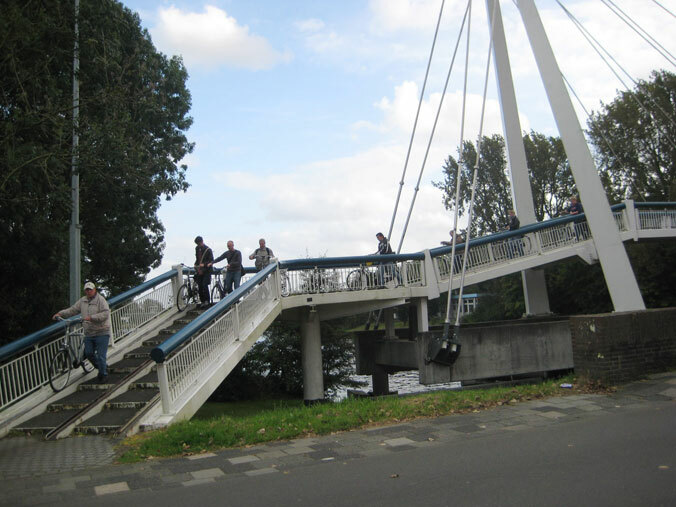 A bridge built in the early 20th century about 1.5 metres wide currently carries two directions of pedestrians, cyclists (dismounted of course), buggy passengers, wheelchair and mobility scooter users, and pets. On a busy day the result is of course great frustration. The good news is that this bridge is going to be replaced with a new one costing £7 million, and work has already started. The bad news is that the new bridge will be only 4 metres wide. To many people I expect a 4-metre wide bridge for non-motorised transport sounds generous. But it is obvious to anyone looking at the situation now on a day like Saturday that is is not. It is a short-sighted penny-pinching compromise. Two directions of cycle travel over a long bridge on their own would need 3.5 metres, and the remaining 0.5 metres is not enough for the rest. We never seem to make bridges for non-motoried modes wide enough in the UK. We used to be a nation of great engineers: why can't we learn about this? There is more frustration where the route is taken through Shoreham docks, on more 1.5m-wide gangways that are now required, on a busy day, to take a large volume of cyclists and pedestrians, and which are closed (opened up) to allow boats through the locks. 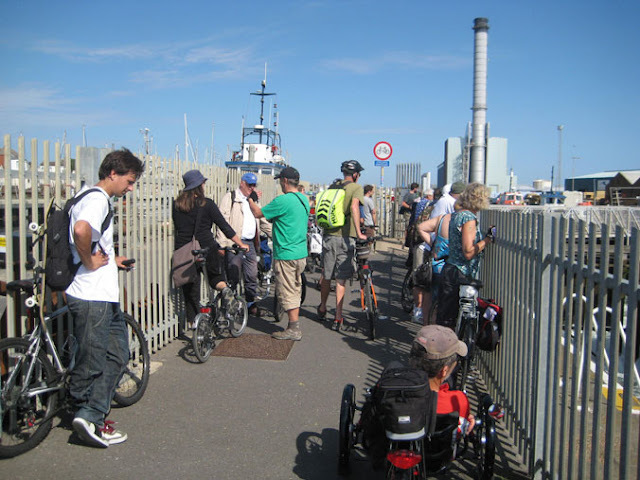 This infrastructure was never designed for having a national cycle route on it, and though it is fun to watch the docks in action, if you are not in a hurry, it is poor that this is all we can achieve. 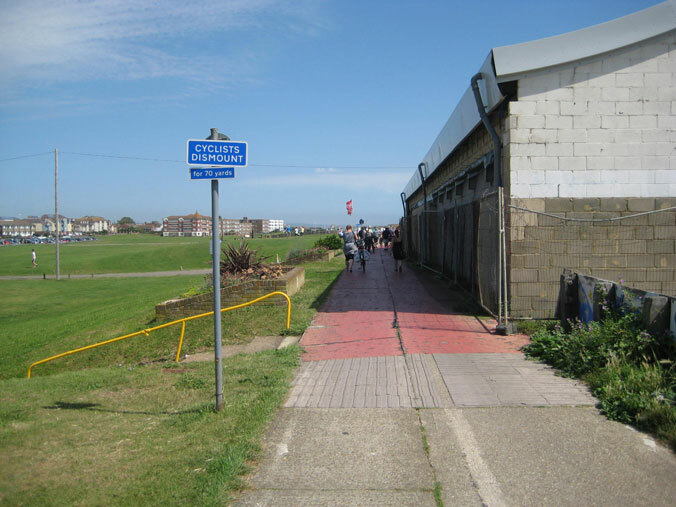 It is symptomatic of the way the NCN has been cobbled together from mostly existing bits and pieces, rather than actually having been planned and built as the real national prestige project it should have been. More dismounting and waiting, and waiting, at Shoreham docks. What's needed at Shoreham docks is something like this wheeling-channel bridge provided for when a lifting bridge is up in Groningen, Netherlands. 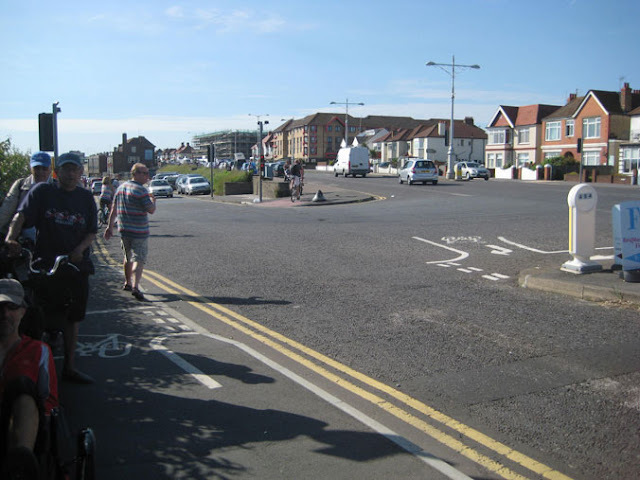 My main criticism of Sustrans (and I make this criticism of their concepts in London as well as on the south coast) is that in the many places where there is no alternative to putting the routes on main roads, they seem to shy away from pushing for real changes to these roads (real changes meaning not just dabbing paint on the pavements), and they seem to have no adequate concept of how cyclists (including young children) should be accommodated there.This leads to a lot of what Paul Gannon used to call "toytown engineering", which may not be directly Sustrans' fault but that of local authority officers implementing their route proposals, but still seems a fundamental inadequacy of the NCN project. "Toytown engineering" refers to the familiar meaningless, isolated, little constellations of white lines and squiggles on roads and pavements that indicate impossible, impractical or foolish cycling manoeuvres and which baffle all road-users. This kind of nonsense is also very influential in spreading the myth amongst "serious" cyclists that "cycle routes (or cycle paths) are slow". 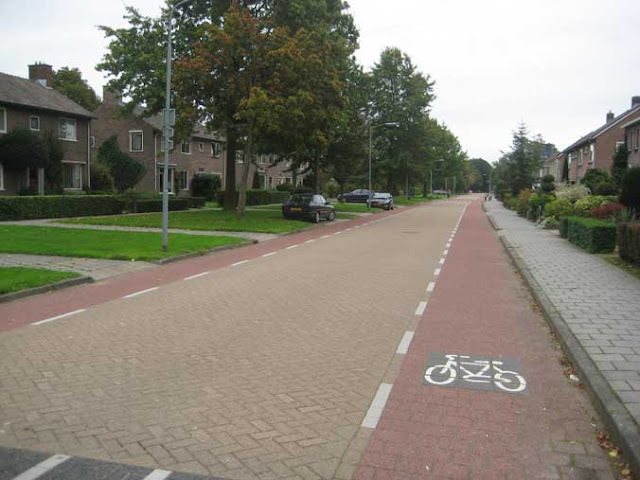 They are only slow if they are no good, and Dutch cycle paths are very far from being slow. The safari did visit some better cycling infrastructure, however. 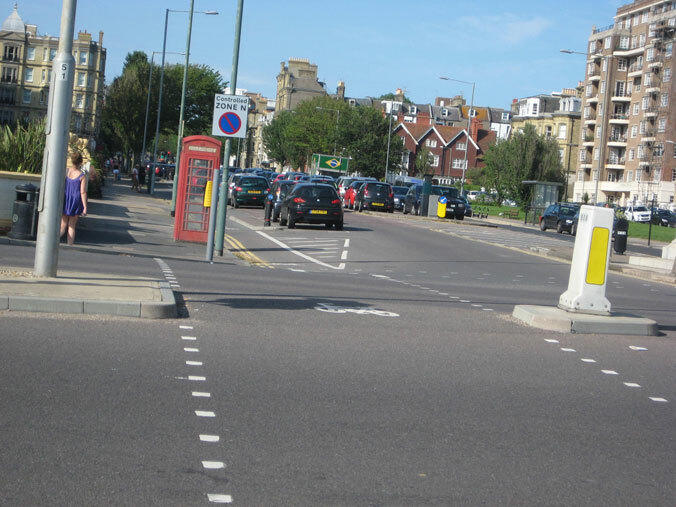 Where it reaches Brighton seafront, NCN 2 works better on its paint-segregated path as it is further from the sea than it is in Worthing. Furthermore, the route connects to two other good pieces of infrastructure in the town, which show different effective methods of segregating cyclists from cars on main roads. 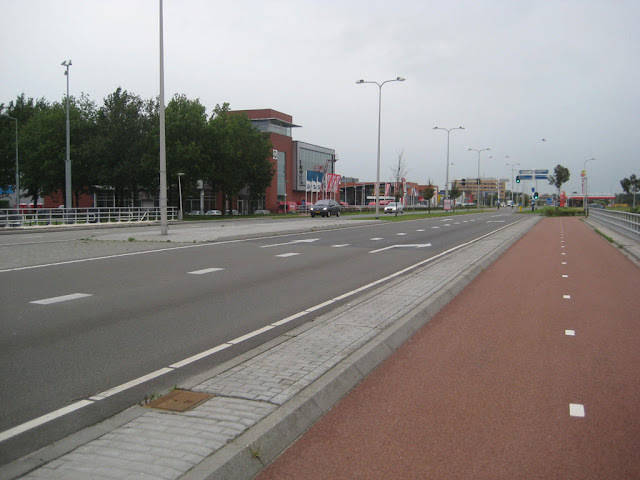 The first is on Grand Avenue and The Drive and consists of one-way cycle tracks on both sides of the road at carriageway level, separated from the carriageway by car parking outside kerbed segregating strips about 1 metre wide. The segregating strips reduce the chances of cyclists getting hit by opening car doors, which is in any case unlikely because the parking is in the direction of travel, so it is only a passenger door that could open into a cyclists' path. One their wider section in Grand Avenue these tracks are wide enough to allow one cyclist to overtake another. Grand Avenue and The Drive connect the seafront route to the other new facility, the route on Old Shoreham Road, created this year by the Green-controlled Brighton City Council. 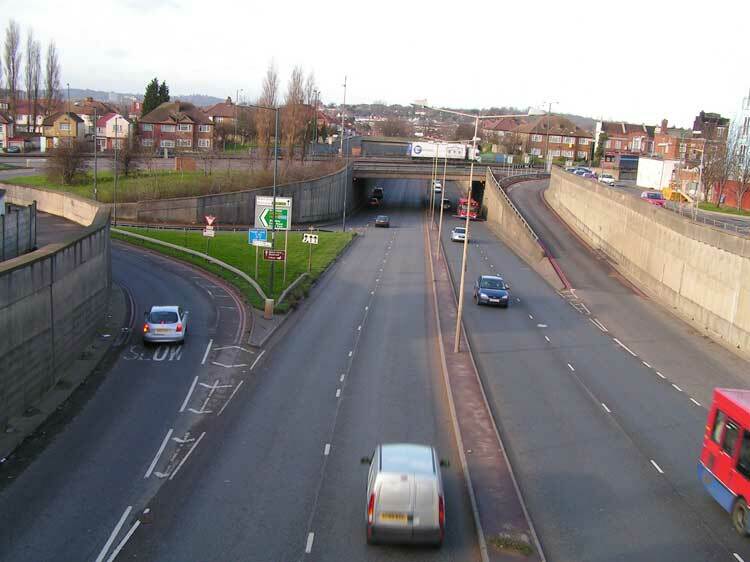 This consists of single direction segregated tracks on a road that passes three schools, the space having been taken by greatly narrowing the previously-existing carriageway. These tracks are at an intermediate level between carriageway and pavement, and are good-quality, with a smooth surface, and there is no adjacent parking. The side roads are either closed-off, with mode filters that allow cyclists through, or they have give-way lines which give the track priority. 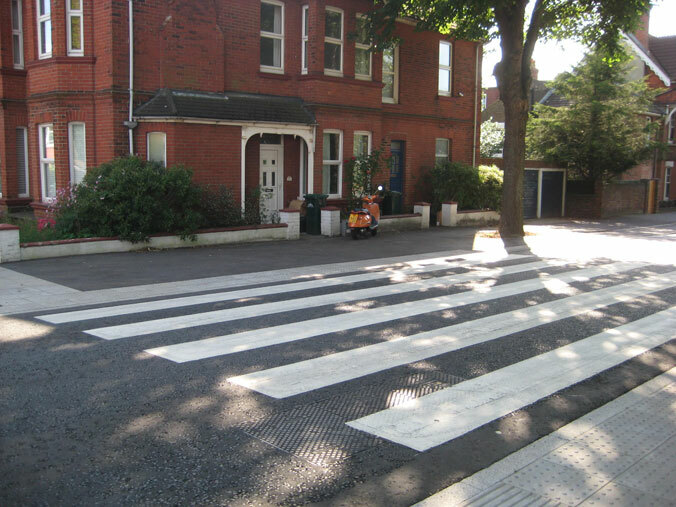 The centre line of the road has been removed, and this, combined with the narrowing, and the provision of a very wide zebra crossing on one place, has, according to local accounts, greatly reduced traffic speeds. 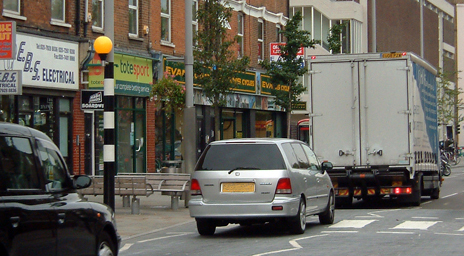 At one traffic lights, an advanced green phase for cyclists reduces the potential for conflict between cyclists going straight on on the track and traffic turning left from the carriageway. There are still problems with these facilities and they are not up to Dutch standards consistently. 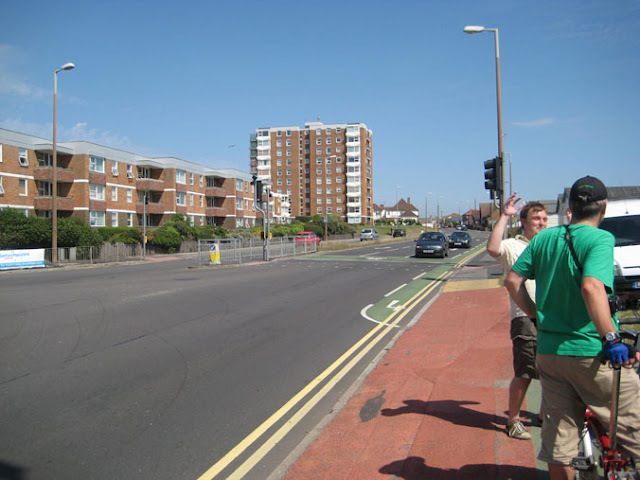 There is no help for cyclists turning from the track on The Drive to the track on Old Shoreham Road at the traffic lights, the right-turn here being executed in the normal UK fashion, with a cyclist needing to pull out across the lanes of general traffic. However there is enough here that is pioneering (for the UK), and effective, for these facilities to be given high marks. 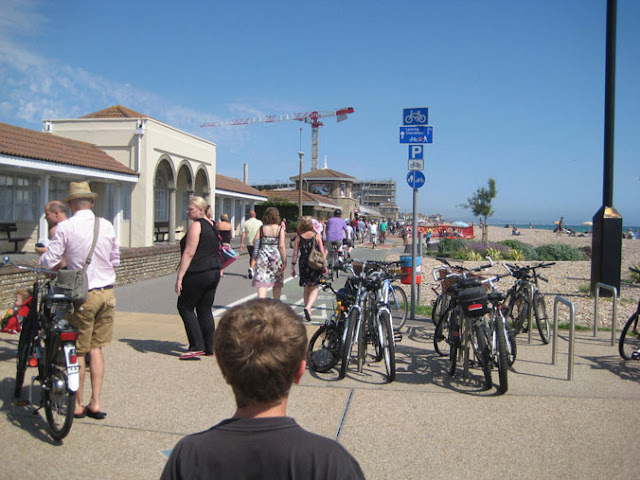 But most of the people I saw on bikes on Saturday were not on the cycle paths of Sussex. They were on the roads of East London, on which I made a journey for a different purpose on Saturday night. It was one of the hottest nights of the year, and everybody who had not left the stifling city for the seaside or the countryside seem to have decided to party that night. London Fields in Hackney was virtually one huge, spontaneous, communal barbecue. I suppose because people had decided to party, and drink alcohol, and thus could not drive (the suppression of drunk driving being one of the great UK road policy successes of modern times), that this, combined with the weather, and the temporary exodus of cars from the streets due to the Olympics and other summer factors, combined to produce a situation where people seemed to be on their bikes, at night, in huge numbers throughout Islington and Hackney. These night-time cyclists are the ghosts of the city. They are not generally your type of dedicated, highly-equipped commuter cyclist. They will largely disappear when the traffic returns on Monday morning. 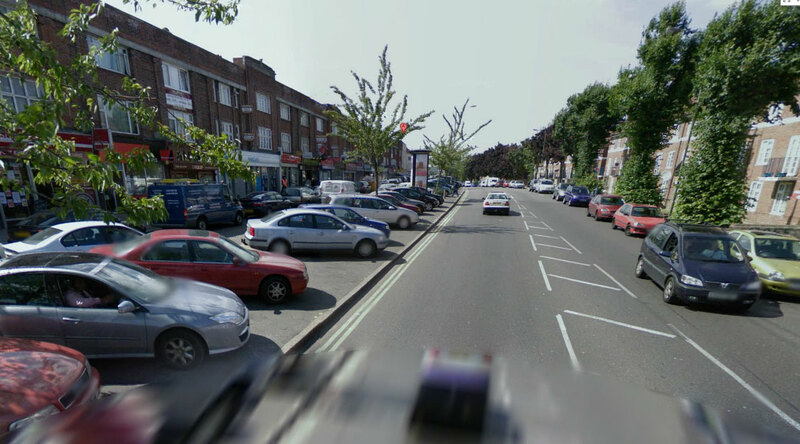 Most people won't cycle when there are large volumes of motor traffic present. But for a while on a hot, relatively car-free Saturday night in East London these cyclists seemed spontaneously to have taken over the streets. The lack of motor traffic did not mean conditions were very safe. 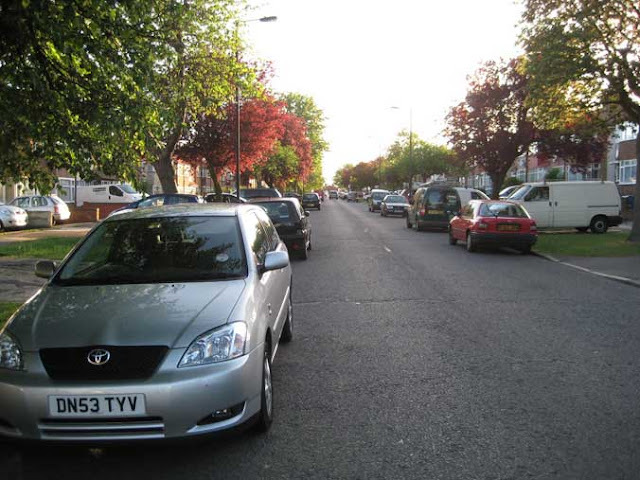 I experienced a conflict with an aggressively-driven car at a pinch-point on a road by London Fields, where the driver did not seem to be able to predict, as I could, that we would both arrive at the pinch-point at exactly the same time, and that therefore he would not be able to pass me. And I witnessed plenty of danger due to fast driving on main roads at junctions. Getting large numbers of cyclists on to the streets and reducing motor congestion does not improve the behaviour of drivers of itself; there is no "safety in numbers" for cyclists in this sense, as the rising casualty rate for cyclists at the same time as a rise in cycling rates illustrates. 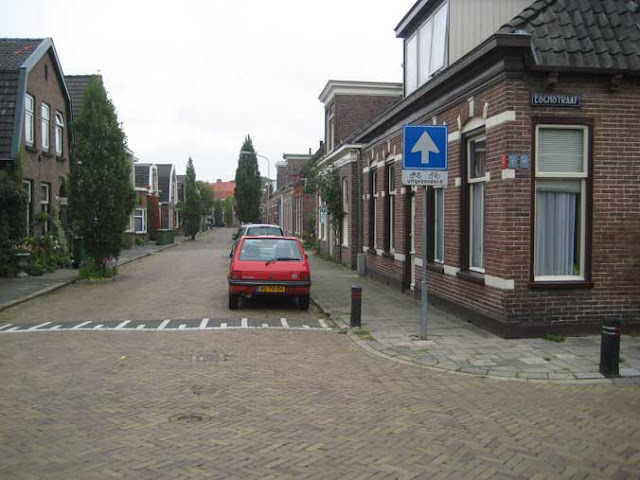 The apparently better behaviour of Dutch drivers is not due to the large numbers of cyclists in the Netherlands, it is forced on them by better infrastructure design (for example, narrower carriageways and tighter and better-controlled junctions). Despite the under-resourcing of cycling infrastructure, the problems of the political structures, and the absurd policies of London's Mayor (his latest brainwave being not fixing the roads but providing cycle paths alongside railway lines – and do we have surface railway lines crossing central London? 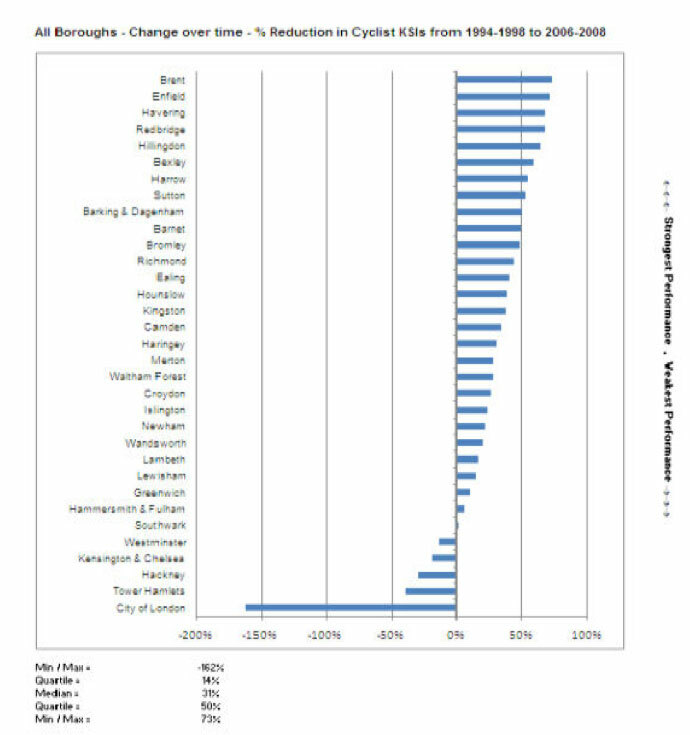 – no we don't), there are some limited grounds for optimism about the future of cycling in Britain. There are one or two examples about of satisfactory infrastructure which could be copied and extended. There is a massive popular desire for safe cycling space, particularly from families, which could start to translate into noticeable political pressure. There is the general feeling arising from the Olympic summer that it is the duty of government to provide for people being physically active. 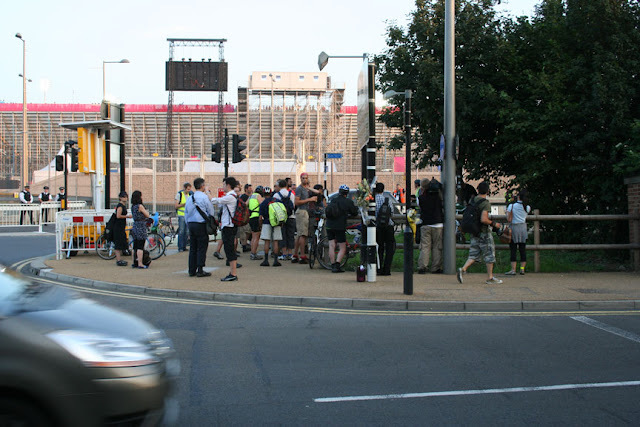 There is a more coherent world-view and platform from the various cycling organisations, as was apparent in the debate on cycling held in the London Assembly last month, part of their enquiry into the subject. And when unusual circumstances occur, the emergence of bikes in the inner London boroughs (but not yet in the outer ones) can be quite striking – possibly the austerity of recession also has something to do with this. But which way it will all go is still hard to predict. After some hints that he would say something about a "cycling legacy" from the London Olympics, Boris Johnson announced on Friday (or rather re-announced) that next year there will be a two-day festival of cycling in London to be called (rather boringly) RideLondon. There seem to be two main elements of this. The first is a "family fun ride" on an 8-mile loop of closed roads in central London: exactly what we have had for several years annually, under the name, first, of Freewheel, and then, of the Sky Ride. This idea, was, indeed, originally suggested by the London Cycling Campaign (but not by me) to the previous mayor. The other, new, element, is a 100 mile road race for amateur and professional racing cyclists that will use a route similar to the Olympic road race. The reaction of various cycling organisations and websites to this news has been of a certain form. But I'm livid that a one off event is being spun by the powers that be as a "permanent legacy for cycling" in London. It is nothing of the sort, and sadly only demonstrates the utter paucity of imagination from the people whose very job it is to run our city. The London Cycling Campaign welcomes these events, but shares the disappointment of many Londoners that an announcement supposedly offering an ‘Olympic legacy’ for cyclists doesn’t include any new infrastructure to make London’s streets more safe and inviting for cycling. The Cycling Embassy of Great Britain welcomes the Mayor of London's newly-announced Ride London festival. However, we note that, while closed roads for cycling, even for only two days a year, are obviously appreciated, a real legacy for cycling would be to make the roads of London safe and inviting for people of all ages and abilities, every day of the year, not just for a weekend in August. So, all of the form, "We welcome this, but..."
Ever iconoclastic, I'm going to break the pattern. I don't welcome it. Not at all. I've been to enough of those Sky Ride type events. They are horrible. They amount to a kind of unique torture for cyclists, cramming us together like sardines in a tin on a few niggardly-handed out kilometres of closed roads in central London, for which privilege we have to suffer a bombardment of unwelcome music, moronically-cheery "motivational" announcements over PA systems, the advertising of sponsors forced down our throats, a sea of stupid yellow tabards, the promotion of helmets, and the presence of boring cyclesport celebrities. Like everything else to do with the official treatment of transport cycling in the UK, it's just another insult. If you've seen the Netherlands now, you've seen what we could have in the UK. We could have spacious, calm, relaxed, quiet, helmetless, tabardless, traffic-free cycling for everyone, every day of the year, everywhere in the country, without damaging the economy, or banning cars. Sky Ride, or RideLondon, or whatever it is called this week, is just a grotesque travesty of this vision. I hate the whole thing, and I will not be going. If I do, it will be only to hand out Cycling Embassy publicity to try to built the campaign for transport cycling to be treated seriously by the UK. The road race, well, there's nothing wrong with having that. I'm not interested in it, but I have no objection to it, but still, I'm not going to say "I welcome it but...", because there's no particular logic in me saying that. 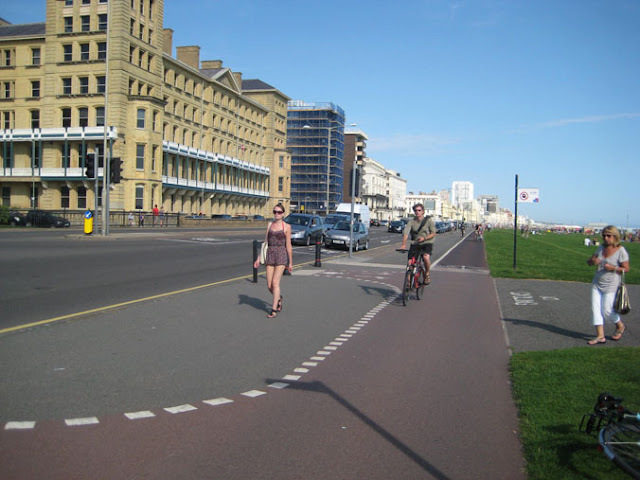 What I am interested in is building an everyday cycling culture in the UK similar to that which exists in the Netherlands, based on infrastructure, if that's at all possible. But even if cycling does see a boost, and even if that boost does turn out to have legs, is that something for a “segregationist” to take much pleasure from? I doubt it – the entire thrust of Olympic cycling coverage has been about cycling as an extreme sport. Whippet-thin men with improbably muscular thighs careering along at 50kph+ on carbon bikes, got up in canary coloured lycra, helmet and wraparound shades, duelling other riders and occasionally coming to grief. All this on enclosed elliptical tracks or roads totally closed to non-official motor vehicles. There is more than a whiff of danger even without the HGVs and the boy racers to contend with. Segregationists, I submit, are about the very young, the fairly old, and the otherwise faint-hearted [in other words almost the entire population], who would like to use a bike in the manner of a wheeled pedestrian. There is absolutely nothing for them in this. Sure, some youngish men, and maybe indeed some youngish women, may be inspired to take up sports cycling. They will be drawn from those who are fit, confident, relatively unconscious of their own mortality, and assertive, perhaps aggressive in temperament. In other words, like the dominant cycling culture we have today, on our commuter journeys as well as out on weekend rides. To borrow from those popular postcards people pin above their desks, You don’t have to be fit, fearless, and aggressive to ride here – but it helps! Just as (apparently, according to the BBC last night) Darwinism can explain the athletic prowess of African-Americans through their experience of slavery and the journey across the ocean that brought them to it, the condition of our roads has evolved British commuter cyclists to have the genes which render them more likely to behave in the manner which upsets and infuriates some pedestrians and apparently all Daily Mail readers. We are caught in a vicious spiral of conditions breeding attitudes which in turn reinforce those conditions. I can see nothing in London 2012 which will change that – it will take something considerably more radical. When you have created such good conditions for cycling as the Dutch have, and cycling becomes normal transport from kindergarten to dotage, non-utility cycling also mushrooms and blossoms in every conceivable direction. Far from there being a lack of "enthusiast" or "sports" cycling in the Netherlands, the country is full of racing cyclists, time-trialists, Audaxers, long and short distance touring cyclists, leisure and enthusiast cyclists of every description, even, would you believe it, mountain bikers (there are specially constructed rough and muddy mountain biking courses, to make up for the lack of true mountains, or even hills). Every town of consequence has a racing bike track (far from the case in the UK), and you see all these breeds of leisure and sports cyclist far more frequently than you do in the UK. I think it works this way round. The pyramid of cycling must stand on its broad base, it can't be inverted. I see no evidence that the encouragement of cycle sport, by itself, in any way influences conditions on the roads that utility cyclists (or indeed non-sporting leisure cyclists) have to cope with day in, day out. 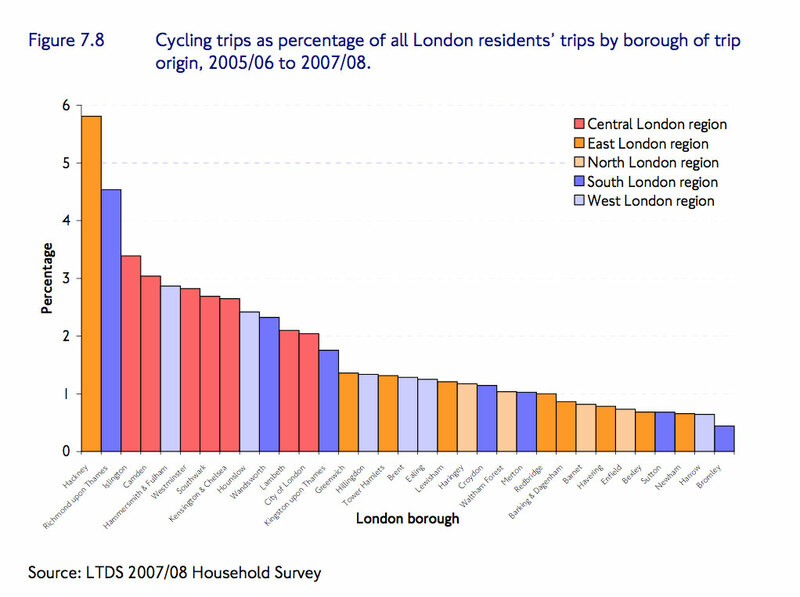 The thing I notice is that most people involved in cycling want to believe that this is not so. They are, even when they are engaged day to day in campaigning for better cycling conditions, as are, for example, so many good members of LCC and CTC, pretty much to a man, or to a woman, at least to some extent interested in the sporting side of cycling, and they want to believe there is a connection. They want to believe that if cycle racing is held in high esteem, that if half the nation follows Bradley or Chris's every move, if Team UK is winning races and if roads in Surrey are closed for the peleton to pass, that somehow this overflows into more people on bikes generally and stronger political demands for roads safe for cycling. But in reality all the confusion and hoo-ha following Bradley Wiggins's ill-advised pronouncement on cycle safety and helmet-use just shows how difficult all this is. If we get into a world that is about speed, competition, risk, adventure, what have you, we are going further and further away from what we actually need to normalise everyday cycling in the UK. There is no way that these elite athletes, who are going to keep getting asked for their opinions on everything from helmets to cadences to energy bars to the best colour for a cycle superhighway, are ever going to be experts on safety or cycling policy. The more we in the UK focus on the image of the bike as the tool of a sport, it seems to me, the more the picture of ordinary people of all ages and fitness levels using bikes for daily short journeys goes out of focus. The more we associate cycling with speed and courage, the more reasonable seems to be the view of the "right" place for cycling as part of a flow of motor traffic, the "Effective Cycling" view of cyclists "driving" their bikes that has driven cycling into extreme marginalisation in the English-speaking world, that concurs with Boris Johnson's view that cycling on multi-lane gyratory systems designed for fast motor-vehicle throughput is no problem "if you keep your wits about you". So I'm not going to "welcome" the organisation of a 100 mile race round the home counties by the Mayor of London, just as I'm not going to "welcome" Wimbledon, and I'm not going to "welcome" the Epson Derby or the London Marathon. I have absolutely nothing against any of these events, they are all great things to those who follow or participate in those sports, but they none of them have the slightest connection to the promotion of cycling as transport, and none of them belong in a paragraph of the form "I welcome..., but if we want to see everyday cycling...". I was standing at a small vigil on Friday, the day Boris made his boring announcement. It was the vigil for Dan Harris, the cyclist killed by the Olympic bus at the entrance to the Olympic Park the night that Wiggins won his gold. There was a small group of cyclists there, not more than 30, and a lot of police standing round at a respectful distance from the crowd, the ghost bike, and the "shrine". The feeling I got was that we were like a tiny sect being guarded over, gently but firmly controlled, and overlooked by the security apparatus of the state. We were like the Druids who are allowed to have a ceremony at Stonehenge at midsummer, so long as they don't damage the monument, or like some other tiny minority religion, being humoured and allowed to exist by the state, though regarded essentially as a curious, slightly nutty irrelevance. That's how I think the British state regards non-sports cyclists. The reality is, behind all the warm words of encouragement, that we are held at a cold, tolerant distance. We are utterly marginal to the main thrusts of our state and society. And this is simultaneous with the whole nation loving Bradley's sideburns and Pendleton's... whatever. We at the Cycling Embassy of Great Britain want to see an end to cyclists being pushed to the margins; we want to see a network of direct, well-designed, separated cycle routes that are safe even for young children to use. That's it. That's how it works. RideLondon is not a step towards that in any way, and I condemn Boris Johnson absolutely for it. The vigil for Dan Harris. More pictures here. 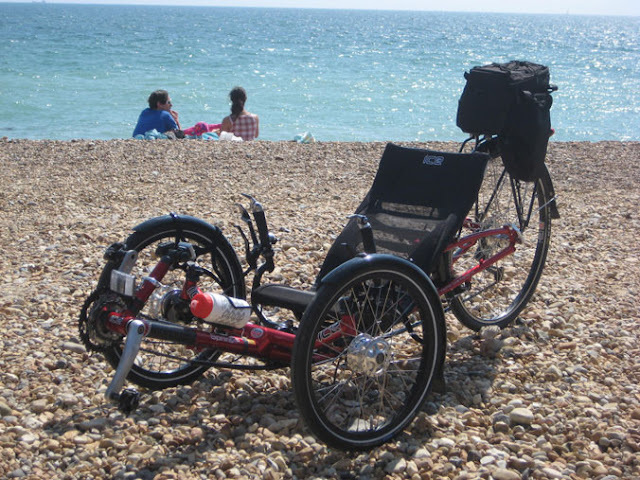 A summary of all this might be to say that though we in the UK have started now to treat our cycling sportsmen and sportswomen as heroes, our public authorities still treat those who try to get around on a bike like dirt. It's a weird juxtaposition, and one that, through its sheer existence, shows the folly of trying to equate popularity of high-level cycle sport with the dedication of political and public respect and resources to transport cycling. It shows rather that this contrast can exist, and maybe even the more we elevate sports cycling as the image of the way bikes are used in this country, the more we depress and crush the simple concept of the easy mode of transport for anyone. I'm not certain of this idea, but I throw it into the philosophising as a suggestion worth of consideration. For throughout this whole saga everyday cyclists and their organised representatives have been ignored, patronised, conned, insulted, fobbed-off, and treated as a minor irritant, not really cared about at all, by the ODA, LOCOG, the Olympic boroughs, the government, the cycling Mayor, and Transport for London, while these all claimed to espouse some kind of "cycling revolution" or "renaissance" that was nebulously linked to sporty cycling. The vigil for the death of Dan Harris will begin with a ride from the National Theatre (where Critical Mass gathers, though this is not a Critical Mass event) setting off at 6:30pm. The vigil itself will be quiet and dignified gathering at the crash site, at the Lea Interchange on the north perimeter of the Olympic Park, from 7:30 to 8:30pm. There has been some controversy arising out of the fact that the family of Dan Harris have reportedly said that they do not wish his death to be used for "political purposes". But it should be apparent from what I have written above that his death was not an isolated and random event, it was part of a whole history and scenario which is deeply political. Perhaps the family do not yet appreciate this. Every cyclist death on road systems where cyclists' interests have not been taken in the slightest way into account is a political issue. It was totally right for LCC, as a cyclists' representative body, to refer to the death of Mr Harris in its press release and public statements about the need for safe junction designs for cyclists in London. 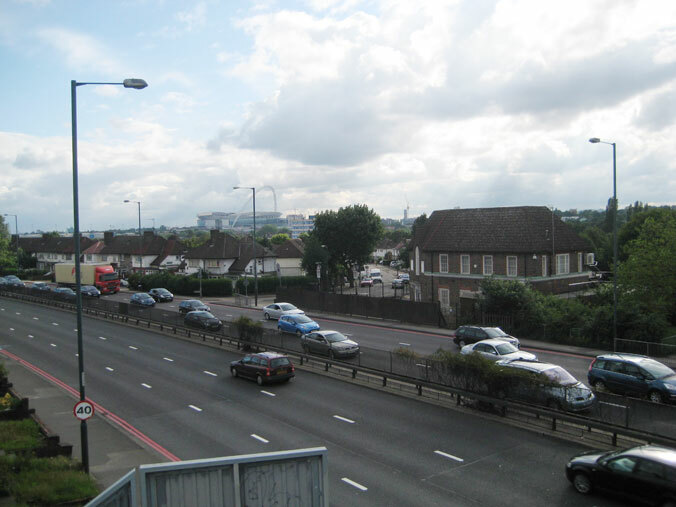 It is their job to try to prevent such tragedies recurring, therefore they need to describe what has actually happened, in a specific case where representations were made about a dangerous road design that was not fixed, where a predictable death subsequently occurred (exactly as at Bow roundabout). To make the points they have to refer to the specific case. This is an entirely defensible and moral thing for them to do, indeed not to do so would be immoral. There is a tradition in the UK of road deaths being swept under the carpet as "accidents" that "should not be used for political purposes". The results are injustice, and more deaths. Bereaved families have to greave, but the rest of us should take action. *Update: this announcement was merely of another Skyride-type event for next Summer, not of anything worthy the epithet "legacy". Utterly pathetic, but no surprise.